Out in the vegetable garden, the harvest continues on a near daily basis. 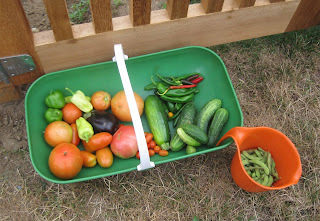 I'm currently picking tomatoes, peppers, cucumbers, summer squash, and for the first time this morning, edamame. While the harvest is wonderful, there are a few missing players. My green beans were a flop. They were starting to form just as I left town for a week and temperatures during the day were in the high 90's. They are small, starchy, and even the rabbits refuse to eat them. They are only good for the compost pile. My sweet corn is also nothing to be proud of or write home about. "Dear Mom, I did not get good pollination in my little patch of corn and so the ripe ears are only partially filled out. I suppose I could still pick the corn, slice off what is good and cook it that way. Maybe I shall. Love, Carol". Or maybe the corn will all end up in the compost bin with the green beans? The compost bin is where all those plants go that didn't make it, or did make it and have finished their lifecycle. Here the right reverend Hortus Augustus McGarden* officiates at a memorial service every so often to honor those plants that served so well in the garden and those who did not serve so well. They are all treated the same. Hortus's dear mother, Granny Gus McGarden* provides the music. Then the worms and microorganisms take over and turn all of those dead plants into nutrient rich compost which I harvest and spread back on the garden for the next generation of plants. And so the garden continues. It is sad, but yes, we must move on. My daughter was so disappointed that the sugar snap peas dried up. She liked to harvest them. At least the peppers are still going & it's probably time to start thinking about sowing lettuce again. I hope your garden gets a break. Alas ...most of my plant ended up in the compost pile this year or were eaten by some critter. Not a good year at all for a garden for me. Anything I can will be with purchased produce from the Farmers Market. Much of my garden ended up with LOTS of grass, but we're still harvesting plenty enough for me to can! My vegetables didn't fare well at all this year. I am ready to start my fall garden with visions that I will have a better harvest. Ah, so that is what my compost bin is missing--a memorial so that the plants that have passed on can move on to a speedier decomposition. It's been kind of a strange year in the vegetable garden for me, too. I'm still trying to figure out why my two little peppers plants are still only 6 inches tall. But the tomatoes are early and producing like crazy, so I can't complain too much. Better luck next time with the garden, I don't have much luck with my garden but my Grandmother always had a beautiful garden, wish I had payed more attention to what she was doing. Hello Carol: I live in Westchester County, NY (Zone 6) and am happy to report that our veggie garden this year is doing very well. We grow beefsteak and cherry tomatoes, bush green beans, green zucchini and yellow squash and a variety of herbs. I think one reason that our veggies do so well is that we grow them in two 4' x 8' , 12 inch deep raised beds made of cedar. The organically amended soil warms up earlier in the Spring and drains well during the rains of summer. Although this season has been very hot and somewhat dry, but at least we can then control the watering so that nothing dries up. I wish you better luck with a Fall Garden. Happy Gardening. Have you not started planting seeds for a fall garden yet? Last year I was able to get carrots through November, when I finally picked them in a moment of panick before a freeze. I love gardening, sad thing is that I just moved in last month and can't find enough space to have one.